11693 EP ECUADOR (1937) Andean trees. Scott No 361. Yvert No 353. Large sunken Die Proof in the final color (152mm x 228mm). "FOR APPROVAL" has also been handstamped on top in red ink. 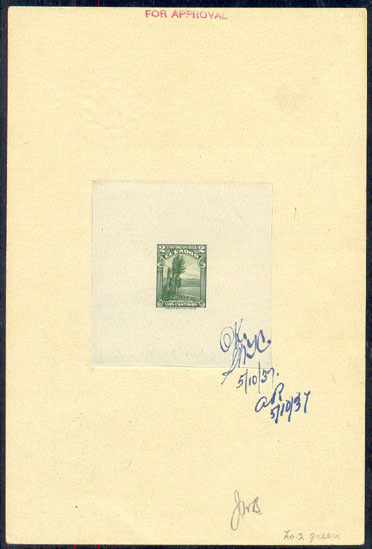 Various administrative indications on the front andthe back tell us that this Die has been engraved from an original photograph and was approved by the engraving order department on May 10, 1937. OK and signature of Mr. COMBS, manager of the foreign department of the American Bank Note Co on front on May 10th. Fantastic exhibit item! The administrative notations make this Proof unique! 11878 EP ECUADOR (1949) Windmill*. Don Quixote and Sancho Panchez*. Cervantes. Horse*. Scott No 523. Yvert No 512. 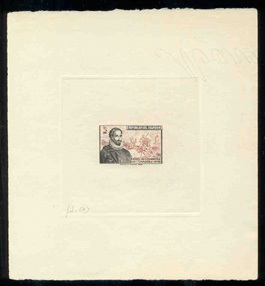 Die Proof in grey and red brown on watermarked paper. Rare!